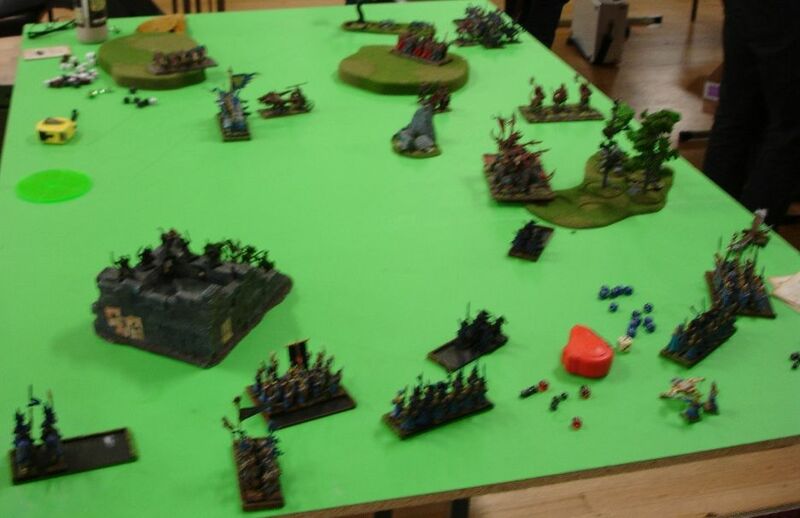 After fighting a greenskin menace I was about to clash with yet another evil army (funny how in this tournament I was facing forces of destruction all the time :)). This time I had a great pleasure to play against Travis and his wonderfully converted Warriors of Chaos army. Travis is an amazing painter (and fast too!) 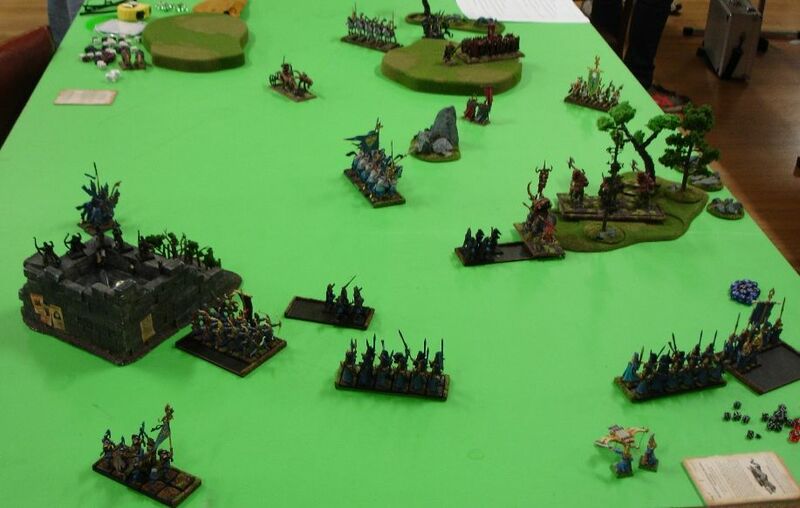 and I have already had a chance to admire his fantastic Gnoblar "Wood Elves" army at CanCon. If I only managed to take better photos from that game. What was also important in that game was the Meeting Engagement. There are a lot of factors one needs to take into account here. Armies can be deployed closer to each other. There is a slim possibility that the enemy will steal the initiative so while trying to take advantage of that first turn it pays off to be a little cautious too. And last but not least it was also a big question mark which units (if any!) are going to end up in reserves. We both had a significant amount of regiments that increased the chances of some of the units being out of the battle field. In general it is an interesting option as it opens new possibilities. But if you end up without your main wizard, for example, it might not be that nice. Very fast and hard hitting army. Each unit was sporting some insane amount of attacks at high strength meaning, that even if I charged any of them there might be enough bodies left to kill many of my fragile elves. With many unit in the enemy formation it would be difficult to block them either. However, I believed I had some chances to fight back. 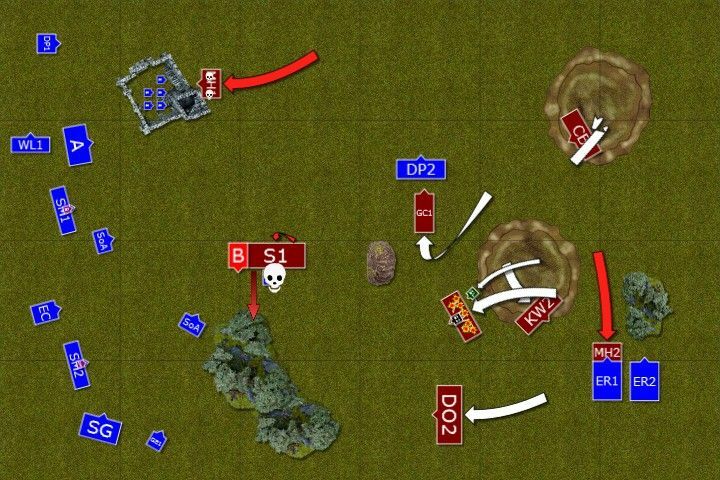 First, my shooting should be able to take out a unit or two before the regiments clashed. Any casualty before combat is a bonus for me. If I also could match some regiments against each other, such as dragon princes against warriors with flaming attacks or two elite units at the same time against Dragon Ogres, then it would definitely help. 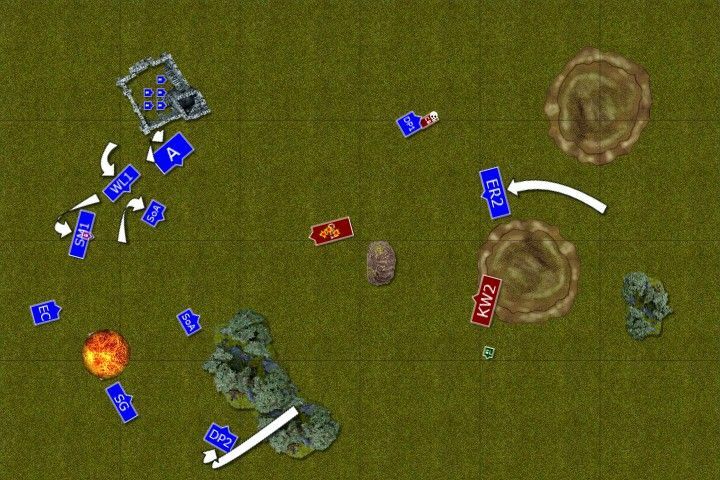 As usual, even without knowing about the deployment, I wanted to make fast troops as my priority and I was looking forward to the light cavalry battle which was sure to happen this game. If I could win it I would be able to use my own fast units to annoy the furious warriors. The question was, even if I did would I have enough time to actually do that. Travis won the roll off and he deployed his army first. Only a chariot and a spawn ended up in reserves. Seeing that warriors are deployed a little further away from my short edge of the deployment zone I wanted to use that to my advantage and put some more space in between our armies. In particular when it occurred that both light cavalry, sea guard and one white lion regiment were all in reserves! There is an advantage in knowing what is the formation of the enemy before deploying your own troops. I tried to use that. Hence dragon princes facing warriors with flaming attacks. Also, second unit was deployed North if the chariot and/or spawn were to appear there as reserves. Also lions formed a second line nearby if the cavalry needed support. I didn't roll a 6 to steal the initiative so Travis begun as planned! 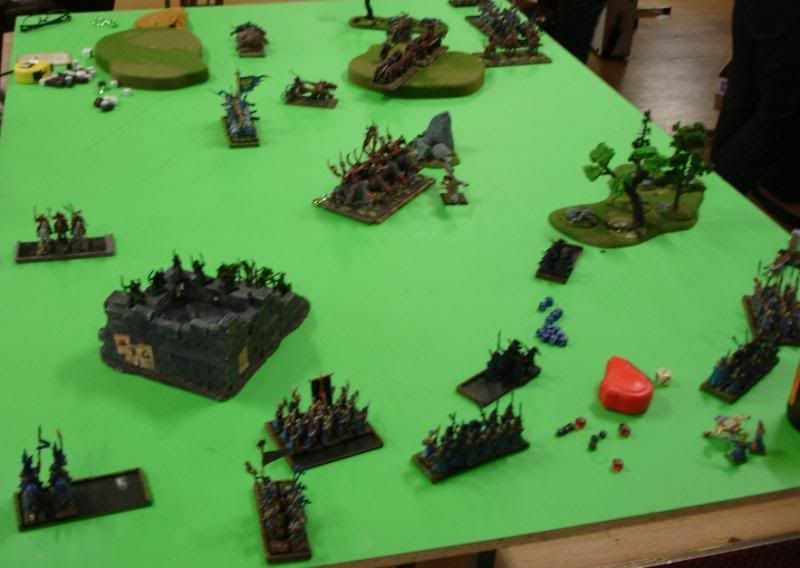 Chaos army moved towards the Elves as fast as possible. 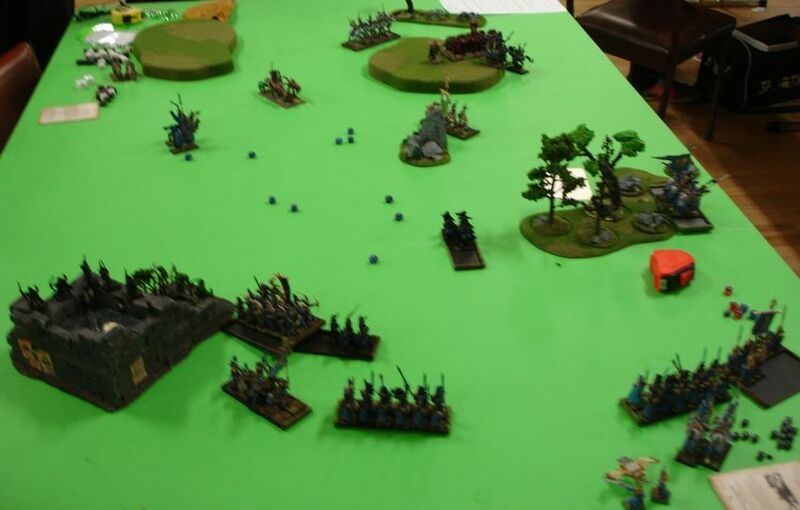 Even reinforcements showed up on North immediately threatening the flank of the Elven formation. 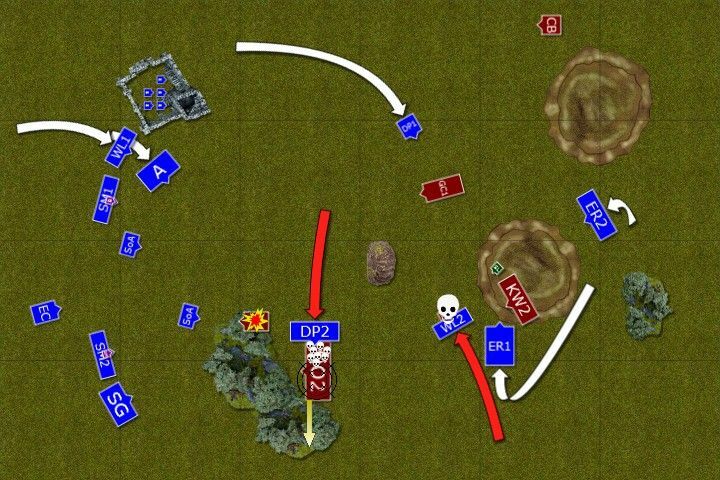 The situation for the Elven army, which was not at full strength yet, looked really serious. 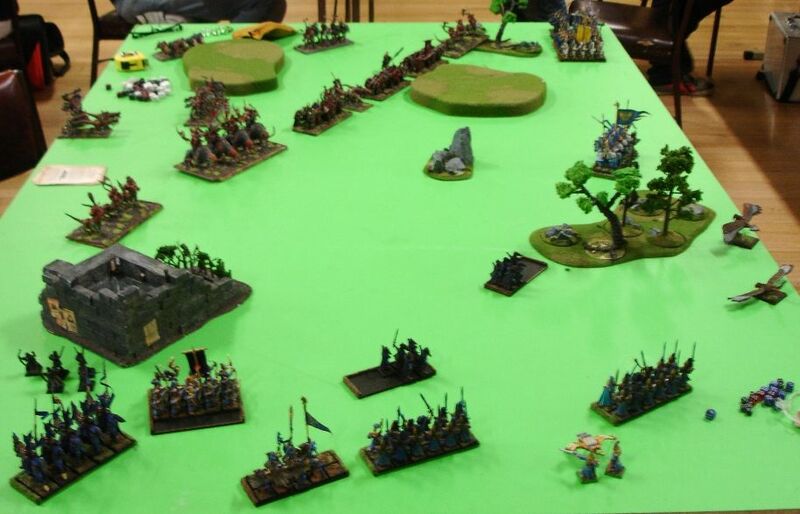 High Elves do not wait for warriors to attack and charge first with preemptive strike. And how best to do so than heavy cavalry? On the North Dragon Princes charged the Spawn and the chariot at the same time. The spawn was quickly killed by elven lances and even the chariot, massive as it was, took some damage. Gorebeast attacked back and 3 noble knights were unhorsed but the remaining two managed to break the evil engine of destruction and chase it off from the battle field. Their companions on South also didn't waste time and charged one of the regiments of warriors. In a rare display of accuracy even for the Caledorians, the knights destroyed no less than 8 enemy warriors and remaining two didn't have a chance to hold. 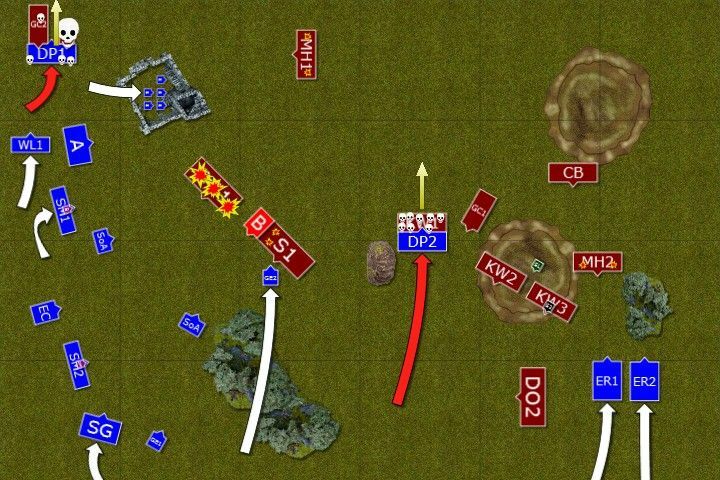 Thus two powerful charges created holes in enemy formation. 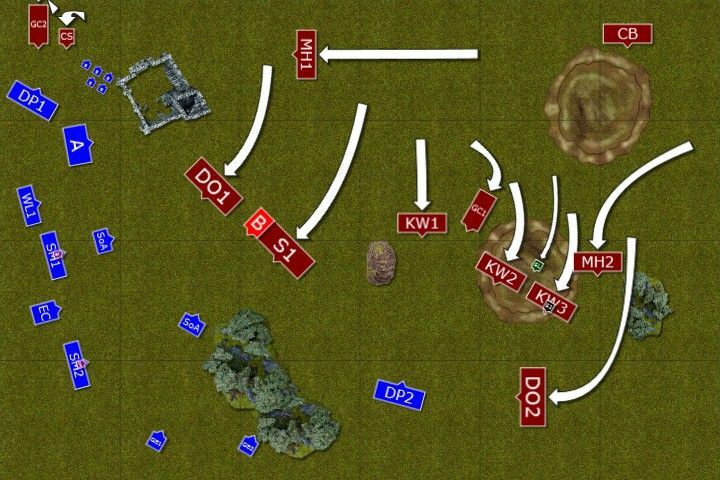 But although the early successes were great main enemy units were approaching rapidly. Seeing this Bob and Larry ordered their troops to focus on the Dragon Ogres. Magic missiles, magic arrows and anything that had a sharp and pointy end was thrown at Dragon Ogres who ... all died in a storm of arrows. Even elven commanders were surprised by their own efficiency. 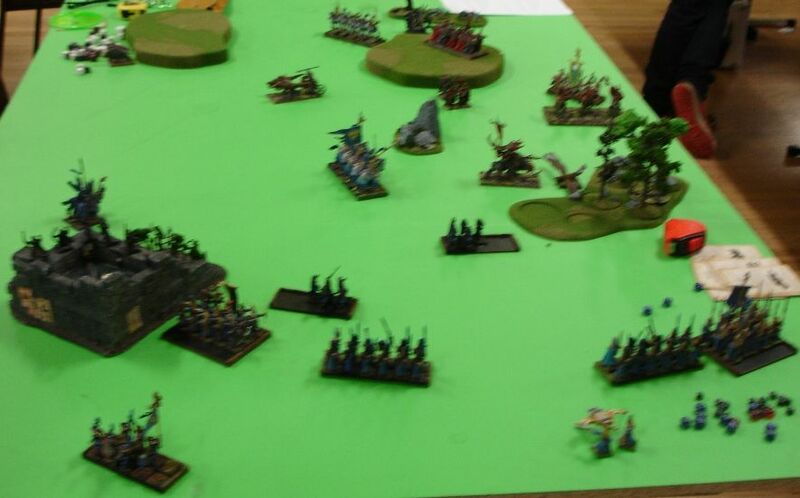 Last but not least, elven light cavalry showed up at the enemy rear and begun their fight against marauder horsemen. After very hard punishment the chaos army has just received it took all the iron will the warriors possessed to brace and keep advancing. 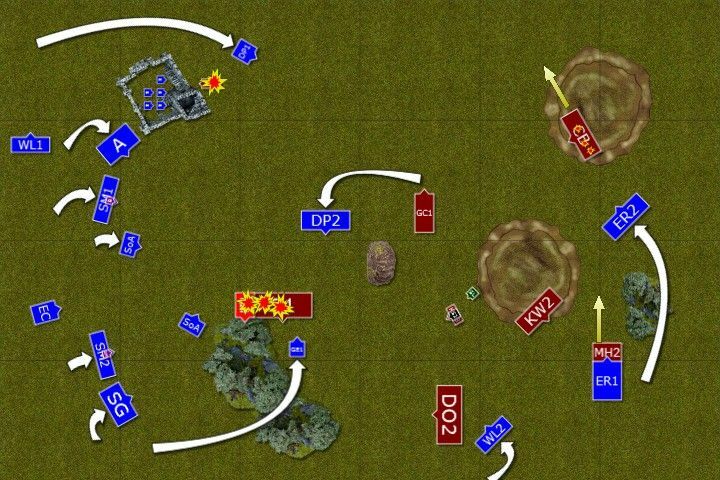 Marauder horsemen counter attacked elven light troops but were either stopped or pushed back. Even skullcrushers are not immune to Elven shooting! Power of the single bolt into a flank! 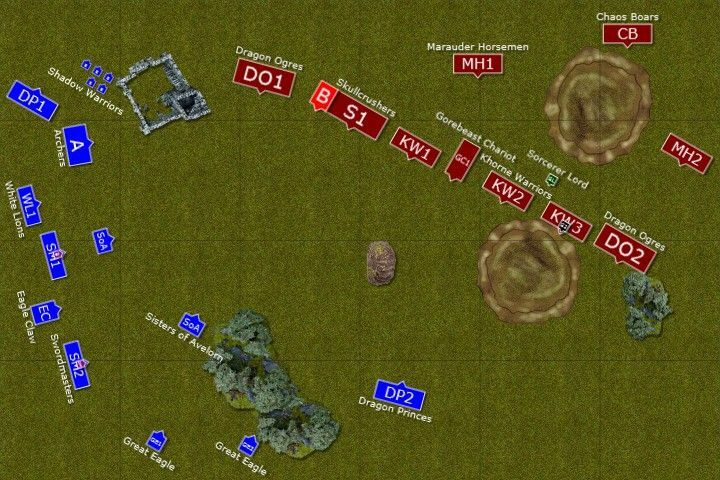 Shadow Warriors begun the shooting and destroyed last of the marauders on the North. On the South, Reavers won combat and broke second unit of marauders, catching them all in pursuit and moving out of the sight of the nearby warriors. Second unit of Reavers went hunting. 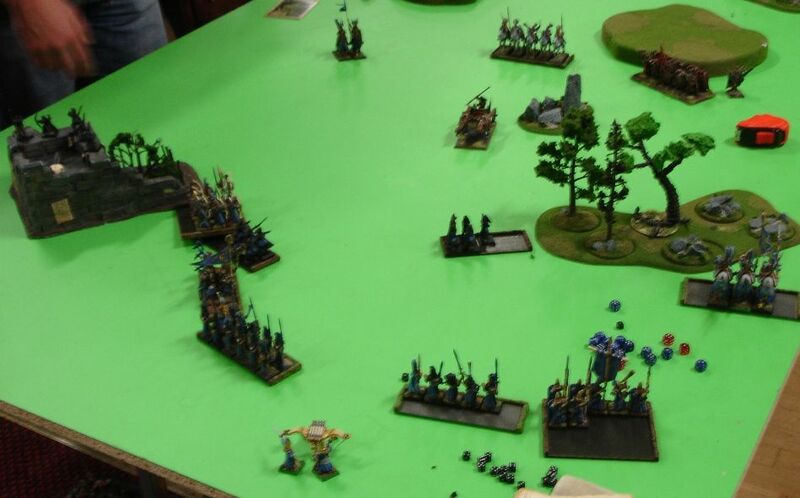 And then the chaos army felt the power of Elven shooting again. Eagle Claw crew spotted a perfect target for their single bolt - unit of skullcrushers exposing the flank! They aimed carefully and powerful bolt pierced the first chaos knight. Then it killed battle standard bearer of the enemy and sunk deep into the flesh of the third warrior in the row. 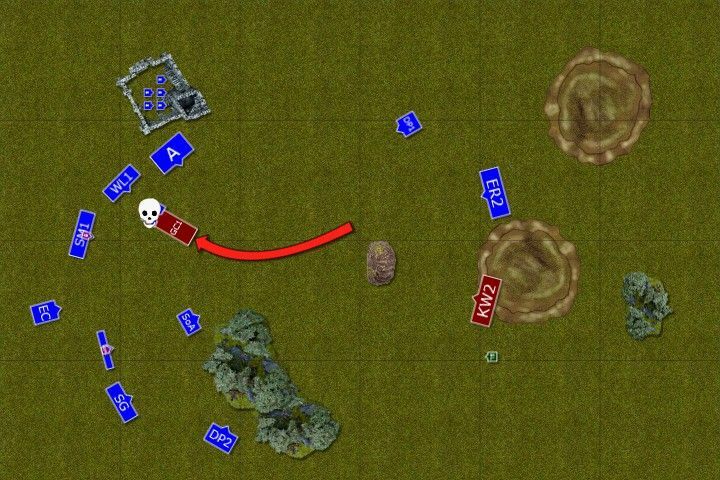 Rest of the shooters aimed at the same target and only a single skullcrusher remained standing. 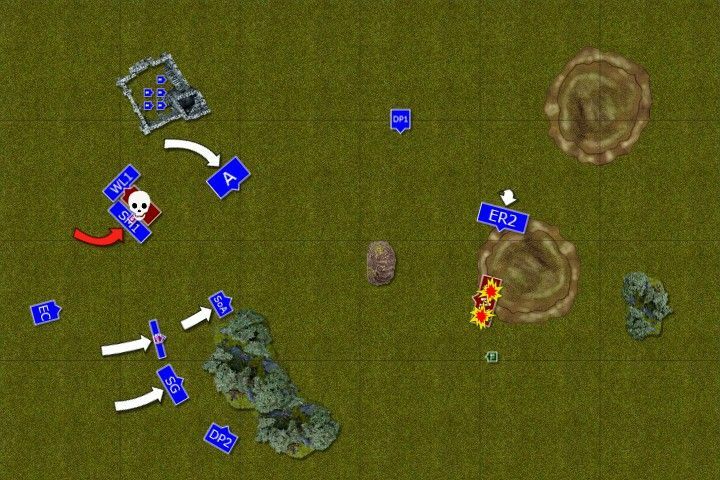 Chaos army suffered horrendous casualties in a very short time but they kept going! Dragon Ogres try to break through! 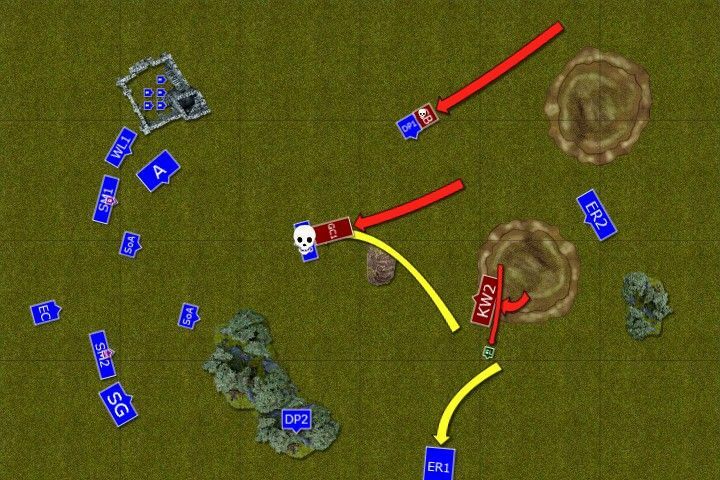 Dragon ogres and skullcrusher hunt down an eagle and use the momentum to close the distance to the enemy. Remaining warriors reform to face the closest enemy - White Lions. Sorcerer Lord unleashes the Plaguewind but only sea guard is affected. A lot of elven warriors die but the survivors stubbornly hold their ground. The shooters finished their job and destroyed the last of skullcrushers. 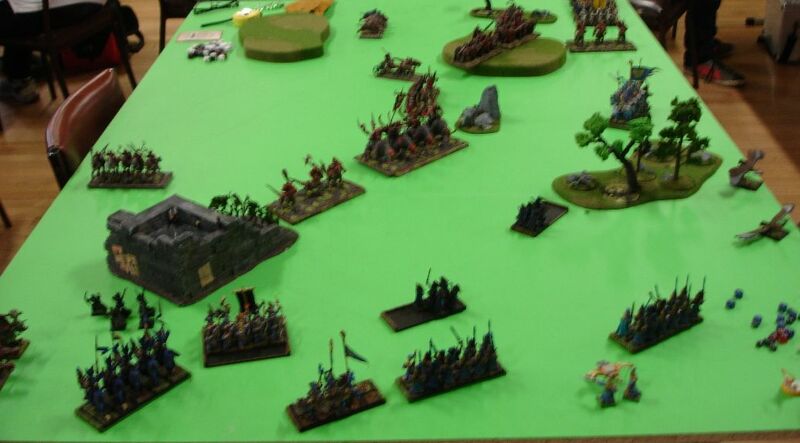 Dragon Princes used another opportunity and charged dragon ogres to the flank. The Loremaster aided them in that combat and Dragon Ogres found themselves much less skillful than they thought they are. Elven knights once again displayed an unusual skill with lances and two hulking monstrosities were dead before their last companion swung his weapons. It broke and was run down in nearby forest. White Lions charge survivors of one of the enemy units of warriors and put them down while Reavers cover their attack. Elven troops seemingly relaxed a little too early and that cost them lives. Reavers tried to pull the warriors out of their direction of attack but ignored the sorcerer lord who chased them down from the battle field. That was enough to make room for warriors to attack now exposed rear of White Lions. They also tried to perform tactical retreat but they were too slow for the chariot. Guess what? - A Cascade! With only a few units of warriors left it was easy to pick the target. But the chariot was too tough to be destroyed quickly and while damaged it kept rolling forward. Larry the Loremaster tried to aid his troops again but again something went totally wrong. Only thanks to the sacrifice of some of his bodyguards he was not consumed by the magical vortex he created. Out of desperation or maybe seeking more honorable death, the chariot charged to kill some sisters and overrun into the Lions behind them. Bob led his warriors in a counter against the chariot and they easily destroyed the damaged infernal machine. Larry, trying to compensate for his blunder, aided his shooters in destroying the last unit of warriors. Only sorcerer lord remained now. With no other options left chaos sorcerer summoned his remaining powers and cast a deadly plague wind. It went through many elven units and claimed many elven lives but no regiment lost their resolve. It was clear the Elves won and chaos sorcerer left the battlefield before he could be caught by the enemy. First of all I would like to thank Travis for a fantastic game! I wish I could handle the situation when things go wrong for me the way he did. I am not surprised he won the best Sport award! Thanks a lot, Travis and congratulations! I honestly didn't expect I could win and win big (got 17:3 this time). But it seems everything that I wanted to work, worked perfectly. 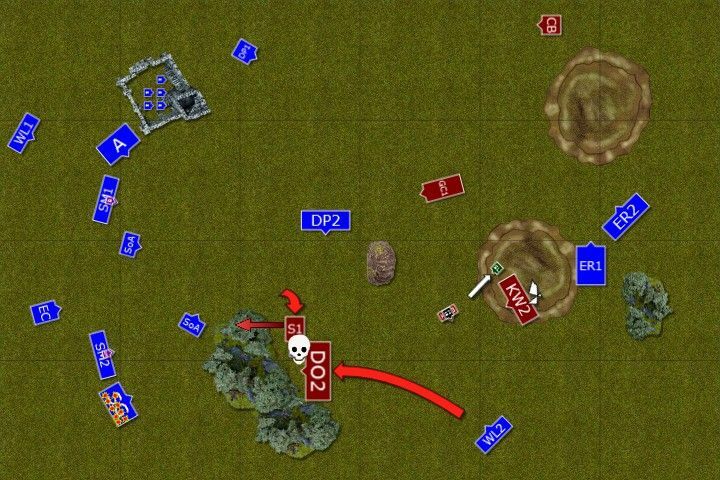 I got early charges with cavalry that either secured my flank or killed one unit and created the big hole in the enemy formation. Then the shooting and magic (cheap magic missiles for the win!) did a significant damage too. Focusing fire on a single target did pay off! Probably quite obvious thing but still. I presume it was a little shocking for Travis to lose 4 units in single turn but it was equally surprising for me too. Sisters of Avelorn are huge threat to forces of destruction. For example, against Dragon Ogres, they wounded on 4+ instead of 5+ and what is more, the armor save went to 6+ instead of 4+. I was definitely lucky with that single shot too, even if the crushers were out of position due to chasing eagles and not threatening my lines yet. 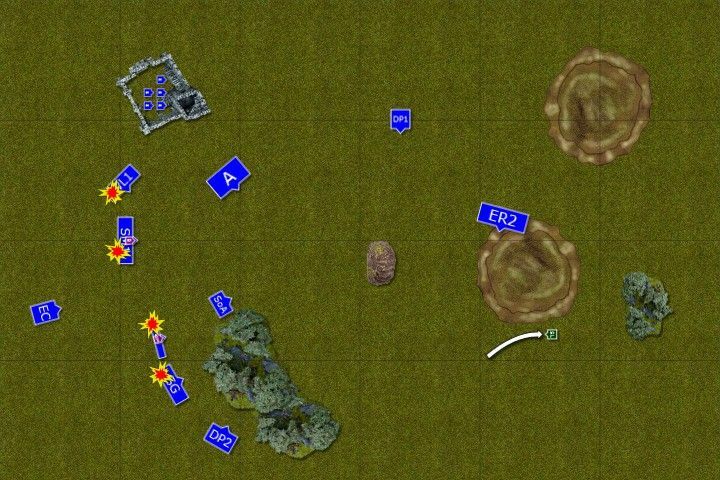 The main thing, however, was that I could put more distance from the infantry as Travis didn't deploy centrally. If only the warriors were closer then I might not be able to divide the army so efficiently. But I was very pleased with the outcome and it terms of performance I believe it was one of the best if not the best game for me on the tournament. A fun report to read! That first turn was a bit shocking seeing just how much damage one round of eleven magic/shooting can do. You did the best thing you can do against a close combat oriented army which was to deploy back and utilize your range advantage. He did a good job weathering that storm and keeping the game fairly competitive. There just wasn't much he could do after that first turn but made a game of it nonetheless. I must say (spoiler alert!) that that was one of the best tournaments I have played in terms of how I liked my performance. I will add a summary of the event after game 6 but this particular game was the best evidence of that I think.